Shelby Materials is Now Entering Its Seventh Decade and Third Generation. 12 locations. Over 150 employees. 1946 | John D. Haehl Sr. and his brother-in-law Thomas J. Wheeler venture into the crushed stone business.They open the Cave Stone Company in Norristown, Indiana. 1951 | Haehl and Wheeler launch Shelby Gravel. The two open a ready-mix concrete plant on the former Barker Sand & Gravel property. 1955 | Shelby lands first major construction project. General Electric’s Industrial Heating Department builds a $5 million factory in Shelbyville. Shelby Gravel ramps up adding a 6-cubic yard mixer truck with the plant only batching 1-cubic yard at a time. 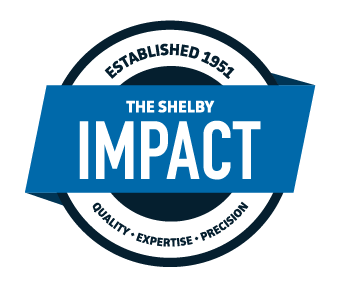 Throughout the decade, Shelby restructures the company for success - keeping Shelby a family owned operation. 1967 | Awarded A Major Infrastructure Contract in Shelbyville. Shelby engages a 10-year-long project to reconstruct Shelbyville city streets. Many are still used today, including McKay Road and St Joe Street. 1969 | Shelby Gravel Opens New Plant. Shelby Gravel Inc. closes the original concrete and aggregate plant and opens a new aggregate and concrete plant on the Kepley farm in Shelbyville. 1970 | 2nd Generation of Haehls Join Shelby.John Haehl Jr and Philip Haehl become active in the management of Shelby Gravel, Inc.
1976 | Shelby Purchases Its First Front Discharge Truck. John D Haehl Sr. remarks, "there is no way to make any money in this business spending $75,000 on a truck." These new 10 cubic yard capacity trucks now cost $220,000. 1980 | John Haehl retires, leaving John Jr., Philip, and Richard to manage the company. 1985 | First computer batching comes to Shelby. Just in time, as Shelby works on the surge of new automotive components factories in Indiana built to serve plants across the Midwest. As demands for higher capacity increased, throughout the decade Shelby erects 4 New Concrete Plants, opens new Shelbyville Aggregate plant and installs a concrete reclamation system. April 1,1997 | Shelby Gravel Inc. begins doing business as Shelby Materials. Third generation Haehls - Matt & Aaron join Shelby Materials. 2007 | A 1.1 million square foot Pepsi Warehouse was completed by Shelby Materials. 2009 | Improved Dispatch Efficiency with Addition of Real-time GPS Truck Tracking. Dispatchers now able to anticipate where or when a truck can be best allocated. From 2010 to 2012 Shelby upgraded all its technology. Including an overhaul of concrete batching and dispatching systems and moving all resources to a centralized computing data center. The result — improved efficiency and critical logistics information delivered in real time to customers. 2012 | Parker Haehl joins Shelby, another of the 3rd generation. 2012 | Shelby opens new ready mix plant in Westfield, Indiana to serve the ever growing northside. And begins work on the New US 31 N Corridor in Hamilton County.